There are a number of item of historical importance located in the environs of Clogher village in south Mayo. Clogher takes it’s name from the great stone of Cloch na hAltora which traces it’s roots back to the Fitzgerald Kenny Clan, the ruling family of the impressive Clogher House Estate. Clogher House was built back in 1770 and was set on 640 acres of land. The vast building housed a Library and a Chapel and consisted of 28 rooms. The House was refurbished in the mid-1800’s but a century later in 1970, the building caught fire and was destroyed. The Clogher House Estate was taken over by the Land Commission and was subsequently divided among local land holders. Another historical building in the Clogher area is Donomona Castle. The Castle dates back to the 15th century and was once owned by the powerful Bourke clan. The affects of warring factions led to the deterioation of the Castle during the 17th and 18th centuries. The ancient Pilgrim Route ‘Tochar Phadraig’ passes through the village of Clogher. The route has gained considerable significance over the recent past as there are a lot of historical and archaeological monuments located along the ancient pilgrim path There are some important Patrician Sites situated close to Clogher most notably, Loona, Gweestion and Drum. In the townland of Killeen, in Drum parish, there is a Holy Well called ‘ Tobermacduagh'. The site is thought to be the burial ground of many unbaptised babies. In the more recent history of Clogher, there was a dance hall constructed in the village during the early 1940’s despite opposition from the local clergy. The Riverside Dance Hall catered for the increase in popularity of showbands such as Brose Walsh, Mademe Bourke, Tony Chambers and The Stephen Garvey Orchestra. 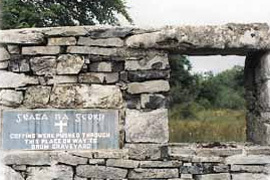 Close to Drum Graveyard is a stile known as 'Geata na gCorp' (Gate of the Corpse) where coffin bearers traditionally rested their burden en route to a burial.